A guest post by John Williams, Ph.D.
Not because he enjoys obscure and occasionally revolting facts, although he probably does. I thought of him because we’ve had an ongoing discussion about the Paleo diet. We agree that it’s very effective and based on sound nutritional premises. But it can be a little thin when it tries to retrofit history and archaeology onto its preferred menu. Since I’m an archaeologist and we’re both history buffs, we sometimes take issue with that retrofitting. So I messaged Lou the chyme link, to which he replied, “Parsley, Sage, Rosemary and Chyme.” We went back and forth like this for a while. I would mention another factoid about hunter-gatherer delicacies, and Lou would come back with a punchline. In a matter of minutes we turned our conversation into a pitch for menshealth.com. When we got the green light, we both started writing. Lou produced a concise 2,300-word article that got straight to the point, with some humor thrown in. I produced a long-winded, 4,700-word essay more suited for Philosophical Transactions: Biological Sciences than Men’s Health. Lou was able to incorporate some of the more poignant parts of my writing into the mh.com article, and gently informed me that the remainder of my thesis would be better suited for a blog post on his website, where readers of the original article could go for more information. So here you go, all 12 of you who actually want more details about lesser-known Paleo foods such as bile, blood, brains, and guts. You’re welcome. When archaeologists read about the Paleo diet, they often cringe at the tendency to romanticize the past. Those tall, robust cavemen had it made, roasting the best cuts of meat over an open fire on a starry night. The perfect life, right? We have a name for this: the “noble savage” myth. The concept was popularized in 18th-century western Europe to describe a general feeling that mankind had become corrupted in industrialized society, straying from a hypothetically harmonious natural state that all primitive societies enjoyed. But archaeologists know better. The amount of unadulterated violence and suffering doled out and endured by our prehistoric ancestors and pre-modern societies would make Caligula blush. Prehistoric people mostly lived short, dirty lives and died young, usually at the hands of another person. According to Harvard cognitive scientist Steven Pinker in The Better Angels of Our Nature, in a tribal society, a man was nine times more likely to be murdered than someone who lived through all of the wars, genocide, and crime in the 20th century (1). This is not to diminish the fascinating story of the human endeavor. At times, life during the Paleolithic was undoubtedly glorious and even poetic. But the tendency has been to gloss over, or ignore altogether, some of the aspects of our past that don’t fit neatly within the noble savage stereotype. I don’t share these details to have fun at the expense of other peoples or cultures here. All of us come from hunter-gatherer stock, and at one time or another, our ancestors delighted in eating foods that you won’t see in Bon Appétit. Today we look at a cow and see sirloin, T-bone, brisket, and ribs. Hunter-gatherers had a much more holistic perception of the animal, looking not only at steaks and kabobs, but also deep into its organs and vital bodily fluids, and even into the bones, all of which were dietary staples. The following is a list of standard fare on the Paleolithic menu that you won’t hear touted very often by paleo diet advocates. In an age before dentists and fluoride, Neanderthals can be forgiven for not having a perfect Hollywood smile. Yet even by prehistoric standards, Neanderthals had really bad teeth that were densely coated in plaque. Archaeologists have studied this plaque buildup under a microscope and found traces of plant food. This is surprising on several levels. We know that Neanderthals were big meat eaters based on chemical signatures left in their bones. 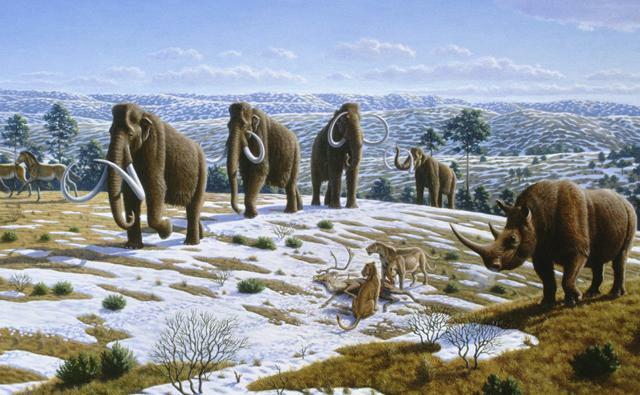 Moreover, they lived in Ice Age Europe, when plants were sparse much of the year. The presence of medicinal herbs such as chamomile and yarrow on their teeth led some researchers to suggest they were self-medicating. Recently, however, anthropologists Laura Buck and Chris Stringer of London’s Natural History Museum have come to a different conclusion: the plant residue that turned their teeth yellow probably came from eating the warm, gooey chyme of freshly killed animals. Why spend the time and energy foraging for vegetables when they’re sitting right in the stomach of a freshly downed reindeer, who had spent the previous day finding and eating the most tender bunches of lichen? It was the Paleo equivalent of picking up a bag of mixed veggies in a grocery aisle, with active live cultures included for easy digestion. Even the bag was a chewy treat of tripe. Eating chyme is not uncommon; it’s been observed in many near-modern pre-agriculturalist societies. In East Africa, the Kuria people use the gastric fluids of cattle, sheep, and goats for ritualistic purposes, slathering it over their bodies like a magical perfume that protects the wearer from harm (2). In the Arctic, where plant food is almost nonexistent, the Inuit and related tribes got most or all of their vegetable food by sipping on the partly fermented and pre-digested content of caribou and muskoxen rumen. Thidwick wasn’t the only ruminant who munched on moose moss. Prehistoric folks didn’t discriminate against bodily fluids. If it yielded any nutritional value at all, they used it. Humans were perpetual vampires, frequently gorging themselves on blood straight from the veins of downed animals, or even ones that were kept alive. Is drinking blood, which is almost entirely protein, really all that different from drinking milk? In fact, milk and blood were commonly mixed into a warm, syrupy protein shake. This was done by several hunter-gatherer groups, in particular the pastoral Maasai of East Africa, whose diet consists almost entirely of milk, meat, and blood from their cattle (3). The milk and blood are primarily taken from live animals, who serve as walking vending machines. Their pastoral lifestyle has persisted for roughly 10,000 years, since cattle were domesticated in that region. In the Llano Estacado of the Great Plains, which covers parts of present-day New Mexico and Texas, Comanche were able to survive the harsh, dry conditions by drinking warm buffalo blood straight from its veins (4). All fluids were appreciated. A real delicacy was the yogurt produced in the stomach of a suckling calf from the fermented remains of its mother’s milk. And mind you, the Comanche were hunting wild buffalo, not herding dairy cows. The next time someone tells you that milk was only introduced in the human diet after the domestication of cattle, remember that hunter-gatherers, since time immemorial, have exploited the milk in the udders and stomachs of downed animals. The earliest unambiguous evidence for cannibalism dates back 800,000 years, to a cave known as Gran Dolina in Spain. Bones from at least 11 humans of species that preceded even the Neanderthals were found butchered and mixed up with the remains of other food sources, including bison, deer, and wild sheep. Every human species since (and probably before) has engaged in man-eats-man. Why? Fair question. It’s nearly impossible to look at any archaeological evidence and project intention. But our best guess is that the bones at Gran Dolina suggest those early humans didn’t think there was anything special about eating other people. The defleshing marks on the human bones at the cave were no different from the others. Nor was there any difference in the way the bodies were disposed of after they were butchered. Pragmatists to the end. In contrast, cannibalism in modern and near-modern times, when not out of desperation, seems to have been more ritualistic. An interesting example is the ceremonial consumption of fallen warriors. The idea was that their power could be transferred to whomever got a taste. For example, Captain James Cook, the famed explorer, was probably eaten by the Hawaiians who killed him in 1779 because he was considered a supernatural being (5). For all the good it did him. In the Tonkawa world, that pot of dude stew was a way to absorb the mojo of the fearsome Comanche, their traditional enemies who had reigned supreme on the Great Plains, and had handed out plenty of ruthless tribal justice for as long as they could remember. Whether it was a form of everyday food, or a ritualistic means of achieving greater power, cannibalism was a part of many pre-modern societies across the world for hundreds of thousands of years. Dietary fat wasn’t easy to come by in the Paleolithic. Vegetable oil wasn’t even a thing, and wild animals were extremely lean. Domesticated animals, like domesticated humans, are much fatter than their wild counterparts. Not only do they carry more subcutaneous fat (the white strip you see surrounding a steak), but they also carry more fat within their muscles, creating the marbled cuts of meat that are most prized. The same cut of meat from a modern cow has many times more fat than from an elk. Take tenderloin, for example. Even though it’s one of the leanest cuts of beef, you could trim off all the visible fat and it would still have more than twice as much as elk, by virtue of carrying more in the muscle. To get enough fat to survive, they had to go a lot deeper – all the way down to the organs and bones. Marrow is a particularly rich source. The marrow from a single tibia of a caribou provides on average over 100 grams of fat. It seems that hominids began exploiting bone marrow around 2.5 million years ago (7). Our earliest human ancestors, the Australopithecines, were all of four feet tall and usually weighed in at less than 100 pounds soaking wet. They were far from the top of the food chain in their East African neighborhood. The physical strength, technology, and brainpower needed to hunt and take down big game came much later in human evolution. So they got their bones by scavenging. A lion takes down an antelope. Our diminutive ancestors would hide in the bushes until the lion ate its fill. Then they’d scurry out, grab some bones, and run like hell to get away from the other scavengers looking for sloppy seconds. (Hyenas, then as now, weren’t exactly lap puppies.) Once they were safely sheltered, they’d crack into the bones with a rock to extract the marrow. Wild animals also store fat in their organs, and their fat deposits fluctuate seasonally. Hunter-gatherers targeted animals during their “fat” stage. They also learned how to exploit the fat, which in wild animals is primarily stored around the gonads, kidneys, and intestines. They could either eat it directly, or cook the animals in a way that released the lipids. For example, kangaroos were slow-cooked by Australian aborigines, who placed the whole kangaroo over coals in a pit, covering the carcass with hot ashes and sand. The abdomen was then opened and people dined on the ‘soup’ gathered in the carcass, comprised of blood and the fat-rich juices from and internal organs (8). Another common method to extract hidden fat was to crush the long bones of butchered animals, bring them to a boil, and scoop off the bone grease that rises to the top. This method was used by ancient and modern Native Americans to make pemmican – a mixture of bone grease, berries, and dried meat that served as the equivalent of modern protein bars (9). Grain alcohol is a relatively recent invention. It happened less than 10,000 years ago. But that doesn’t mean Paleolithic man couldn’t booze it up. There have been several sightings of drunken primates in rain forests across the world. This wasn’t an issue of apes hijacking beer trucks. Instead, some primates have developed a strategy of eating overripe fruit, which has undergone a natural fermentation process in warm, humid environments. Experiments on overripe palm fruit have produced alcohol content typically in the range of beer, and as high as 8.1%. (That’s more than a Guinness.) It didn’t take long for researchers to make the connection from apes to ancient humans, particularly since fruit consumption remained an important part of the human diet up to the advent of agriculture. It’s likely that, over millions of years of evolution, humans living in humid and warm forested areas have regularly consumed rotting fruit with levels of alcohol equivalent to your average beer (10). Scientists have also noticed that, within the fascinating realm of human biodiversity, there is considerable variation in human physical and behavioral responses to alcohol. From an evolutionary perspective, this variation makes a lot of sense if exposure to low-concentration ethanol occurred in some human groups over the course of thousands and even millions of years, favoring the evolution of metabolic adaptations that maximize the benefits of alcohol consumption while minimizing the related costs. Indeed, studies have shown health benefits with moderate alcohol consumption in both fruit flies and humans, relative to abstinence or getting cross-eyed drunk (11). It’s perhaps no coincidence that both fruit flies and humans have evolved for millions of years as frugivorous species. Humans diverged from chimpanzees about 5 million years ago, and researchers at the Foundation for Applied Molecular Evolution in Gainesville, Florida, recently discovered that a common ancestor of chimps, apes, and modern humans developed the ability to metabolize alcohol some 10 million years ago (12). Since then, human groups have apparently evolved distinctive responses to alcohol that at least partially explain the likelihood of alcoholism. For example, alcoholism rates are much lower among East Asians than in Western Europeans and Native Americans (13). It has to do with our biological responses to alcohol. Alcohol is metabolized in a two-stage process by different enzymes (ADH and ALDH), and alcohol preference and tolerance is determined by which of these enzymes is more dominant. Essentially, non-alcoholics have more severe hangovers than alcoholics, and this is a result of which enzymes they inherited. In contrast to the belief by many Paleo dieters that alcohol played no role in the evolution of pre-agricultural diets, it seems that low- and moderate-level alcohol consumption started millions of years before we began eating meat. It’s also clear that after the domestication of grains, they were immediately used for beer and related beverages, along with bread and porridge. In Uncorking the Past: The Quest for Wine, Beer, and Other Alcoholic Beverages), archaeologist Patrick McGovern traces the development of beer from prehistory to present and reveals that alcoholic drinks were nearly ubiquitous in prehistory. They used whatever they could get their hands on to make it – dates in Mesopotamia, mare’s milk in Central Asia, corn and cacao in the Americas, cherries and berries in northern Europe. And it was made nearly everywhere they could find or grow plants with high sugar content. The evidence of widespread alcohol production during the early Neolithic is so compelling that McGovern proposes a radical idea: The first cereals weren’t grown to make bread or gruel, but to brew alcoholic grog. Whatever the cause, there is no doubt that humans have been swimming in alcohol for thousands of years. If Not Noble Savages, then Drunken Cannibals? We don’t mean to take lightly the dangers of alcoholism. For most of human history it wasn’t possible for the average person to drink enough to get addicted. Alcohol became a problem soon after Hellenistic alchemists figured out how to distill drinks with more than 10% alcohol. That was fewer than 2,000 years ago (14). Like obesity, alcoholism can be viewed as a disease of nutritional excess. And where did we learn to eat to excess? Ironically, from the very cavemen we now say we should emulate. To them, gluttony was a rare gift. It ensured survival by storing a bit of body fat they could burn when food was scarce. It’s precisely because we act like Stone Age hunter-gatherers that we’re in trouble today. The Stone Age motto was to eat as much as possible with as little effort as possible. Old habits die hard. Our much-maligned sweet tooth comes from the same ancient instincts. For example, a well-studied hunter-gatherer group known as the Ache regularly got more than 40% of their daily calories from wild honey in the rain forests of Paraguay (15). When they could get their hands on sweets, they eagerly did so. And while we’re grinding axes, we must also debunk the common contention that humans have not evolved since we became Homo sapiens 200,000 years ago, or even since the Neolithic Revolution 10,000 years ago. Therefore, the argument goes, we shouldn’t eat things we didn’t eat throughout our evolutionary history. First of all, wild grains were commonly eaten well before the Neolithic, such as at the 23,000 year old site of Ohalo on the Sea of Galilee (16). But there’s a bigger point: Evolution is an ongoing process. It didn’t stop when we became a species 200,000 years ago. Otherwise, how would you explain the predominance of lactose tolerance in western European populations, who began regularly drinking cow’s milk well within the past 10,000 years? In fact, genetic anthropologists Gregory Cochran and Henry Harpending argue that human evolution has actually accelerated since the Neolithic in their book The 10,000 Year Explosion (17). So don’t get too worried about eating that bowl of lentil soup because someone told you that legumes are a Neolithic food. Lentils were domesticated in the Middle East some 9,000 years ago. Most human groups have had plenty of time to adapt. Those points aside, a 21st-century human can’t really go wrong following the basic Paleo premise: Eat a well-balanced diet with lots of lean protein and healthy fats, and a mix of plant foods including vegetables, fruit, nuts, and seeds. Just don’t go down the path of obsessively trying to keep it real, Paleolithic-style. Eating like a caveman is a ticket to an early grave. John Williams, Ph.D., is an archaeologist based in Denver. In addition to co-writing “The REAL Paleo Diet” with me for menshealth.com, he was a valuable resource for “Should You Go Paleo?“, a feature I wrote for Men’s Health that was nominated for a a James Beard Foundation journalism award. 1. Pinker, Steven. The Better Angels of Our Nature: The Decline of Violence in History and Its Causes. New York : Penguin Books, 2011. 2. Religion and Society among the Kuria of East Africa. Ruel, M. J. 1965, Africa: Journal of the International African Institute, pp. 295-306. 3. Maasai Food Symbolism: The Cultural Connotations of Milk, Meat, and Blood in the Pastoral Maasi Diet. Arhem, Kaj. H. 1./3., s.l. : Anthropos, 1989, Vol. Bd. 84. 4. Gwynne, S. C. Empire of the Summer Moon: Quanah Parker and the Rise and Fall of the Comanches, the Most Powerful Indian Tribe in American History. New York : Scribner, 2010. 5. Captain Cook at Hawaii. Sahlins, Marshall. 4, s.l. : The Journal of the Polynesian Society, 1989, Vol. 98. 6. Smithwick, Noah. Evolution of a State: Recollections of Old Texas Days. Austin : Gammel, 1900. 7. Variability in Long Bone Marrow Yields of East African Ungulates and its Zooarchaeological Implications. Blumenschine, Robert J. and Madrigal, T. Cregg. s.l. : Journal of Archaeological Science, 1993, Vol. 20. 555-587. 8. Traditional Diet and Food Preferences of Australian Aboriginal Hunter-Gatherers. O’Dea, Kerin, et al. 1270, s.l. : Philosophical Transactions: Biological Sciences, 1991, Vol. 334. 9. Bison Processing at the Rush Site, 41TG346, and Evidence for Pemmican Production in the Southern Plains. Quigg, J. Michael. 159, s.l. : Plains Anthropologist, 1997, Vol. 42. 10. Ethanol, Fruit Ripening, and the Historical Origins of Human Alcoholism in Primate Frugivory. Dudley, Robert. 4, s.l. : Integrative and Comparative Biology, 2004, Vol. 44. 11. Conditioning to ethanol in the fruit fly – a study using an inhibitor of ADH. Cadieu, N., et al., s.l. : Journal of Insect Physiology, 1999, Vol. 45. 12. The Natural History of Class I Primate Alcohol Dehydrogenases Includes Gene Duplication, Gene Loss, and Gene Conversion. Carrigan, M. A., et al., 7, s.l. : PLoS ONE, 2012, Vol. 7. 13. Agarwal, D. P. and Goedde, H. W. Ethanol Oxidation: Ethnic Variations in Metabolism and Response. [book auth.] W. Kalow, H. W. Goedde and D. P. Agarwal. Ethnic Differences in Reactions to Drugs and Xenobiotics. New York : Alan R. Liss, 1986. 14. Evolutionary Origins of Human Alcoholism in Primate Frugivory. Dudley, Robert. 1, s.l. : The Quarterly Review of Biology, 2000, Vol. 75. 15. Seasonal Variance in the Diet of Ache Hunter-Gatherers in Eastern Paraguay. Hill, K., et al., 2, s.l. : Human Ecology, 1984, Vol. 12. 16. Small-Grained Wild Grasses as Staple Food at the 23 000-Year-Old Site of Ohalo II, Israel. Weiss, E., et al., s.l. : Economic Botany, 2004, Vol. 58. 17. Cochran, G. and Harpending, H. The 10,000 Year Explosion: How Civilization Accelerated Human Evolution. New York : Basic Books, 2009. Informative commentary ! I was fascinated by the details – Does someone know if my company could get access to a fillable a form document to use ?